The quality sample performance reviews we researched all had one section in common. Leaders need to always provide clear goal expectations to your employee to ensure they know how they can be successful during the coming year. While recognizing employees for their accomplishments of the prior year is critical, one of the most important benefits of the annual performance review is establishing mutually agreed upon goals and objectives for the future. Leaders are well advised to resist the temptation of simply "telling" employees what they "will do". No one likes to be told what to do. People want to be asked their opinion and be a part of a larger conversation. Invite each employee to be a part of the process for determining their own goals – staying within the bounds of what the organization must achieve during the coming year. By including your team members in a conversation to determine how they will achieve the goals of the organization, you may find that their front-line expertise offers valuable insight that you otherwise would not have thought about. Taking a few extra minutes to capture their knowledge on important subject that impact the company can go a long way to gain buy-in from the employee and ensure success for your team. Best of all, this process doesn't take much time, but the benefits for all parties involved can be enormous. A quality conversation around goals, covering the How, When, What and Why, will ensure that both parties are on the same page and fully committed to the process. "To gain 15% increase over prior year in total production by end of 3rd quarter." "To reduce losses by 20%, or $500, within the next 45 days". Next, let’s discuss how we can quickly create a personal development plan. Remember, employers who invest time, energy and money in their employees, get it all back multi-fold in terms of increased production and improved customer/employee retention. Learning options are truly endless. Employees who are self-starters will be the first to take advantage of these opportunities. 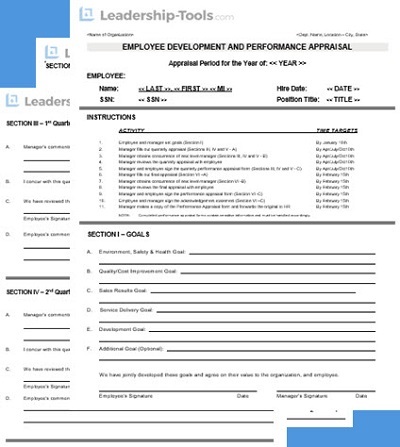 Using our sample performance reviews template you can easily plan for quality discussions on goals and professional development plans for your employees. The final topic in our six-part series highlighting our on sample performance reviews template explains the importance of Timely Follow Up with your employees. This is the perfect time to address both prior performance to goal, and objectives for the coming year. 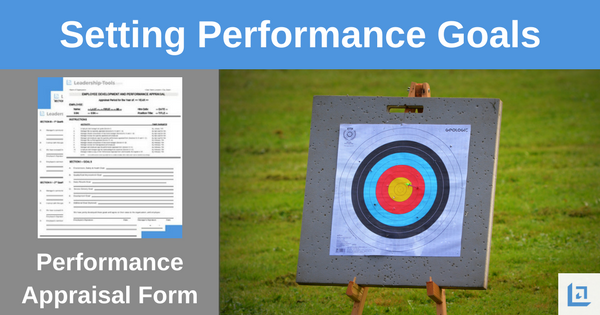 To download our free sample performance reviews template, simply subscribe to our free newsletter. You will immediately receive a password that grants access to our entire leadership tools library.